Sumptuous color, provocative line, and interesting texture soothe your soul and tickle your inner child. Picasso was right: "Youth has no age.” The Loading Dock Gallery’s July Show, ‎Artful Age proves the saying true. Some ‎Artful Age artists have painted for a lifetime. Others discovered art as seniors. Their joy of exploration shines in ‎Artful Age. 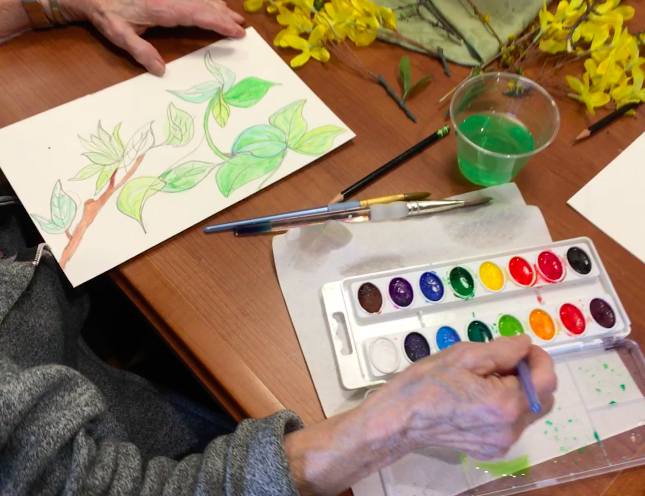 In elder classes, art offers a place of autonomy and discovery. As a student observed: "We came not knowing how to draw a straight line. Now we can paint, and we know that circles are more fun." ​Artful Age: “Youth has no age”. The Loading Dock Gallery, a part of Loading Dock Arts, Inc., a 501c3, is open Wednesday-Saturday from Noon to 5:30 PM, and Sunday from Noon to 4 PM. For more information, call 978-596-1576 or visit www.theloadingdockgallery.com.